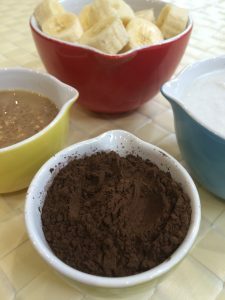 If you didn’t read Part One, I’m trying to reclaim Carob from the culinary backwater where it resides – a little unwanted and unloved. Carob deserves to be more used and appreciated, but it has a strong flavour and colour and needs to be used sparingly. These are absolutely divine: Creamy, highly nutritious, filling. (And vegan). This makes a rich, creamy, smoothie so you’ll get 4 small glasses from that. Kingfisher Coconut Milk brand was 220 calories / 100ml and was 72 % coconut milk. The “light” version was just 80 calories/ 100ml but only 22% coconut. Basically they just replace the coconut milk with water (both types contain stabilisers) and charge us the same amount of money! Other brands were just the same, so I opted for full fat coconut milk and simply added my own water. 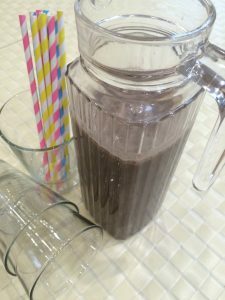 I also made the Carob smoothies with 350ml Light coconut milk and no water. The taste was different but not inferior. Both will give four smallish but still rich, filling smoothies. Well there isn’t much of one. Combine all the ingredients apart from the sugar in a food processor or a hand blender. The latter is maybe preferable because it saves on washing up. Then add the sugar at the end, sparingly, to taste. The sugar brings out the flavour of the carob but you don’t need much. I sometimes use none at all. The determining factor seems to be the ripeness of the banana. The more ripe it is, the less added sugar you need. The creamy consistency with the rich, strong brown colour is an unusual combination. Be prepared: We’re all used to creamy smoothies, or yoghurt drinks, and we’re used to coffee coloured drinks, but not the two together!! For more Carob ideas, check out Part One. Green smoothies are all the rage. Why not brown ones? Much Peace, Love and Laughter! Yes I’m sure it would be good after a workout. Energy and protein…… Sadly though, I cannot eat it – I’m intolerant to both the coconut and the peanuts……I had a few sips when I was concocting the recipe – I had to!! I’m thinking of having green juices more though. I thought they would help my IBS, which is really severe, hence all the foods that I am “intolerent” to. I’m having to start to accept a life of 24/7 bloating and permanently wearing baggy tops to hide it. So depressing!